Fast, Faster, Fastest! 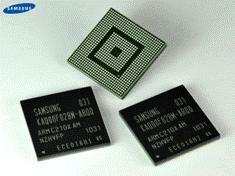 Samsung today announced its dual-core 1GHz ARM Cortex A9 processor and that it will hit the market early next year. This is one of the fastest processors in the market that Samsung has to offer. The tiny processor which is just 45nm in size uses a pair of Cortex A9 cores which have 32KB data and a 32KB instruction cache each. The design is codenamed Orion. The processors boast of a 1MB L2 cache. It also includes a GPS receiver base band processor to enable GPS-location based services. Samsung claims that this new processor packed with power and memory for faster caching will support 30fps video playback and recording at 1080p full HD resolution. If coupled with a GPU this new chip set is said to deliver five times better 3D graphics performance than Samsung’s previous generation. The processor also boasts of a native triple display controller architecture which lets it support dual displays. Samsung says that the first prototypes of net books and tablets including smart phones running on Orion processors will be here soon. Market research says that the demand for faster smart phones packing the dual core processors is set to reach $94 billion by 2015. The processors will begin shipping in the fourth quarter of 2010. A 1000-Core Processor that Handles 5 GB Of Data Per Second! Previous Microsoft says Halo Movie Will Be Out!